Forcing bulbs indoors allows you to enjoy tulips and daffodils on your sunny windowsill even in the middle of winter. It's all easier than you think. 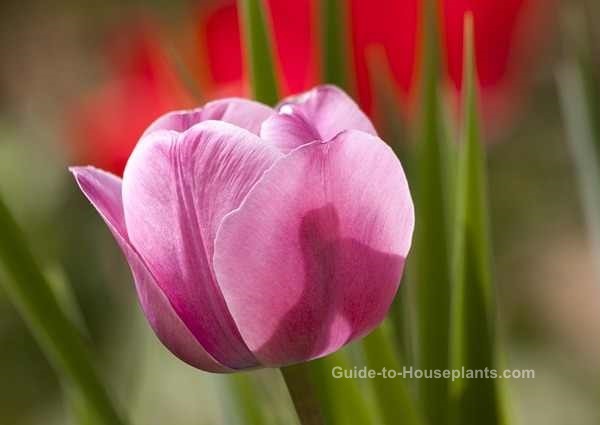 Find out how to force bulbs into bloom. Spring-flowering bulbs can be brought into bloom early -- during the dark, cold days of winter -- by manipulating light and temperature for several weeks. It's easier than it sounds, but requires a little planning. You can "force" bulbs indoors by chilling them in your refrigerator, then bringing them out where they'll grow in the warm sunshine of your window. Flower bulbs are easy to find at your local garden center in fall. Or you can order flower bulbs from a catalog or online. Bulb delivery for crocus, tulips and other spring-blooming bulbs is a fast and easy way to grow your collection. Choose bulbs that are labeled "good for forcing" or recommended for indoor growing. Fortunately, you don't have to wait for spring to get the blooms. 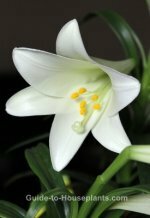 Many spring-flowering bulbs can be forced indoors for mid-winter flowers. Want to learn how to force bulbs yourself? 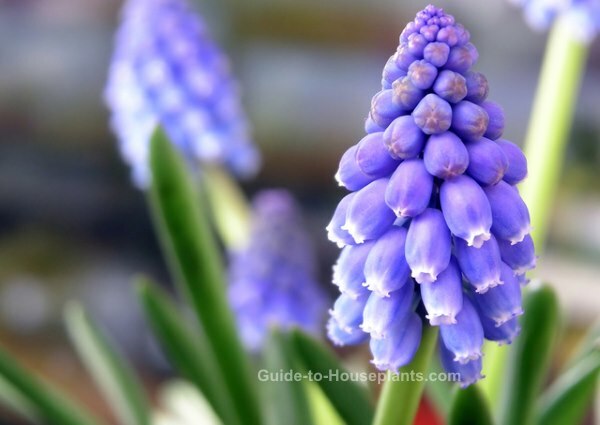 Fragrant grape hyacinths are easy to force indoors. And don't forget about the sunny trumpet-shaped blooms of daffodils. Follow the links to get all the how-tos for forcing them. Dark-blue grape hyacinths are a welcome sight mid-winter. They're lightly scented, too. Among the first to pop up in the garden, crocuses (shown below) are a welcome sign of spring. Force them indoors and you'll enjoy their vibrant blooms in a sunny window. What a view. Take the chill off winter. 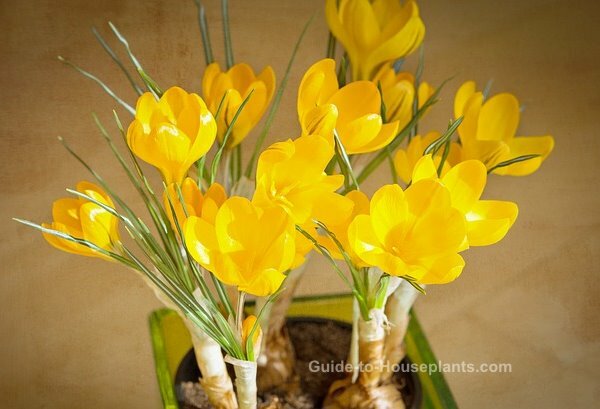 It's easy to warm up your home by growing sunny yellow crocus blooms. Of all the spring-bloomers, tulips (shown below) are my favorite. Triumph tulips are among the best for forcing and offer a huge range of magnificent colors. Tulips are among the most anticipated spring-bloomers. Why wait? Enjoy them before spring arrives. When forcing bulbs indoors, put them in a spot where they'll get plenty of sunlight. 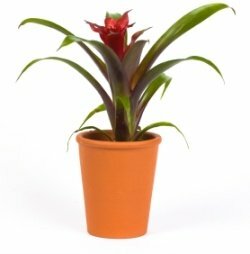 Flowering house plants need more light than most indoor plants. Bulbs that don't bloom usually aren't getting enough light. Fragrant paperwhites are a holiday favorite. They also happen to be super-easy to grow -- no chilling required. Pristine paperwhites are among the easiest to grow indoors. Fast, too...they bloom within weeks. Clusters of snowy, white flowers are held high on slender stems and sometimes need staking to stand up. Lovely paperwhites are native to warm, southern regions of Asia and they don't need to be chilled to promote blooms. Just pot them and they'll start growing right away. 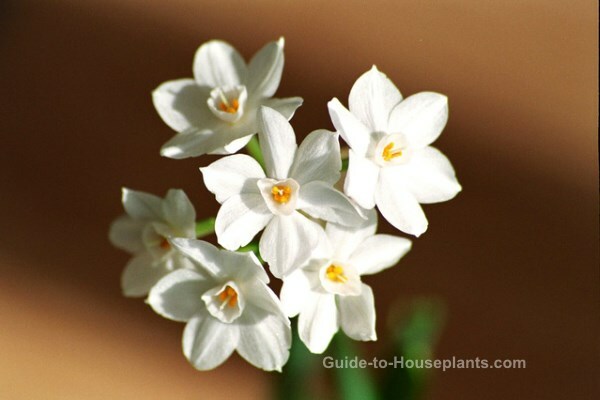 Get tips for forcing paperwhite narcissus here. 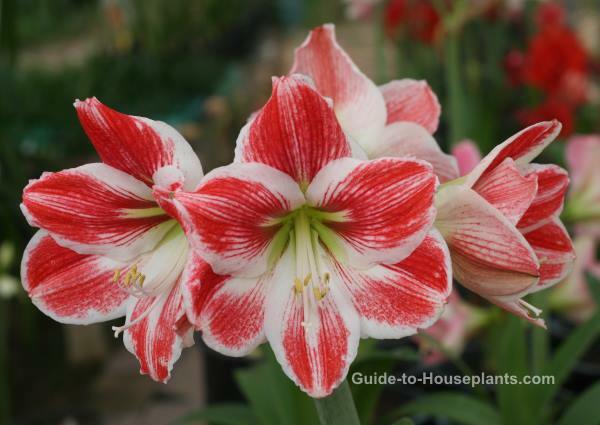 Glorious amaryllis heralds the holiday season with trumpet-shaped blooms. Perhaps the most spectacular are amaryllis bulbs. Their big, velvety trumpet blooms are easy to grow indoors. Dependable holiday bloomers, you can easily bring them into bloom in time for Christmas. Give amaryllis bulbs a summer rest and you can repot them for another sensational show of flowers the following year.